Silver necklaces made with motifs from Cardcaptor Sakura, the popular anime that first started 22 years ago that has a continuation currently airing! These necklaces are made for fans and chosen by fans through voting. The designs were made with Cardcaptor Sakura in mind, so they are delicate and adorable. The latest Tokyo Otaku Mode Project consists of silver necklaces based on Cardcaptor Sakura, the popular anime that has a continuation currently airing! The production of these necklaces will be done by U-TREASURE, an accessory maker that has collaborated with many anime series. These necklaces were designed after the characters Sakura Kinomoto, Syaoran Li, and Yue (Yukito Tsukishiro), who appear in CCS. These necklaces were created from the designs that fans voted on in a poll conducted by U-TREASURE and Tokyo Otaku Mode. More than 10,000 votes were collected to determine the designs that the majority of fans desired. 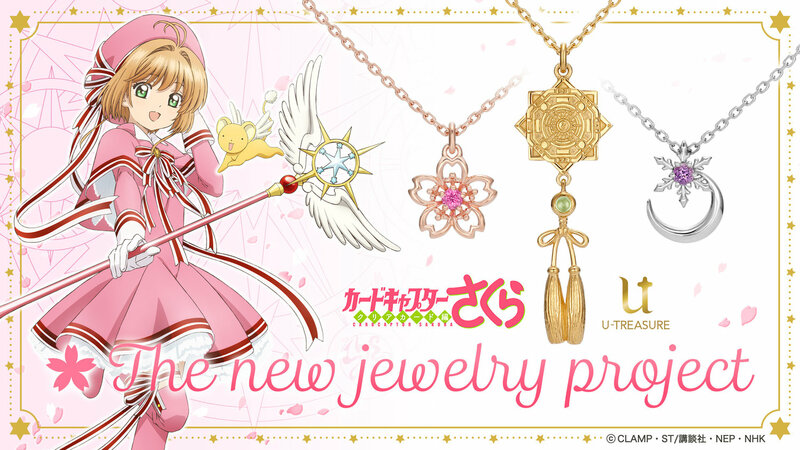 These necklaces embody the world of Cardcaptor Sakura that CCS fans chose. The artisans working at U-TREASURE create these accessories for adults who loved the work as children and can joyfully wear related designs even as adults. The designs are adorable yet inconspicuous, so they can be worn both in business settings or during casual leisure time. They are perfect for new fans as well as fans who have followed the series since its beginning.. 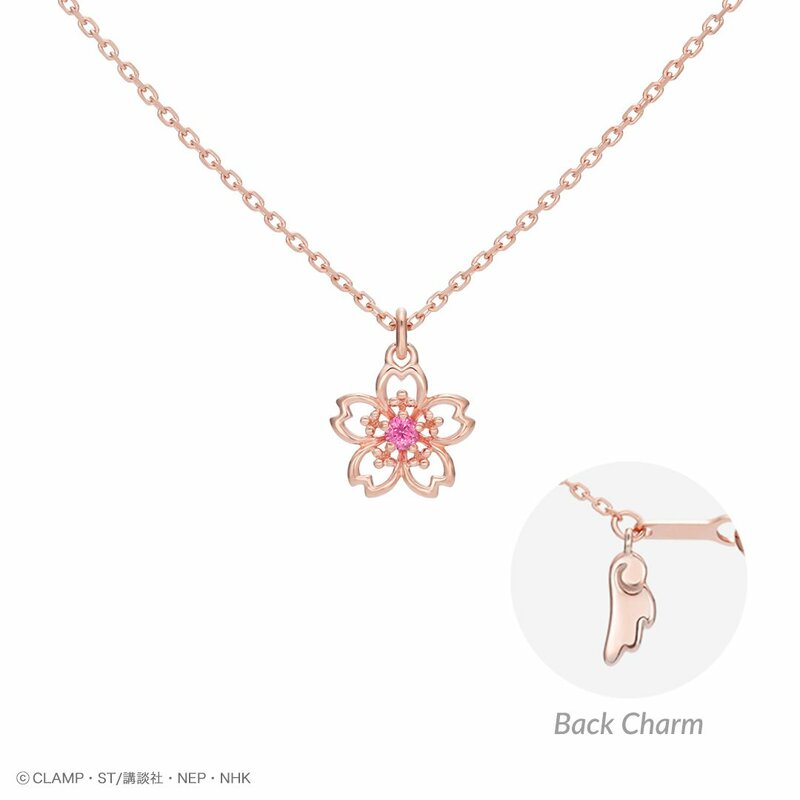 This necklace was designed in Sakura-chan’s image, using a cherry blossom to represent her cuteness and her kindness. “Everything will be all right.” It seems like this necklace will protect you with her words. This is a three-dimensional cherry blossom with delicate details. It is beautifully made so that it is stunning not just from the front, but also the sides and back when seen from various angles. A sapphire in Sakura-chan’s image color, pink, is embedded in the center. The charm on the back of the necklace is the trademark wing. This necklace is packed full of all of Sakura-chan’s loveliest points. This necklace is designed after Syaoran’s Rashinban, which kind and honest Syaoran will use to guide you. 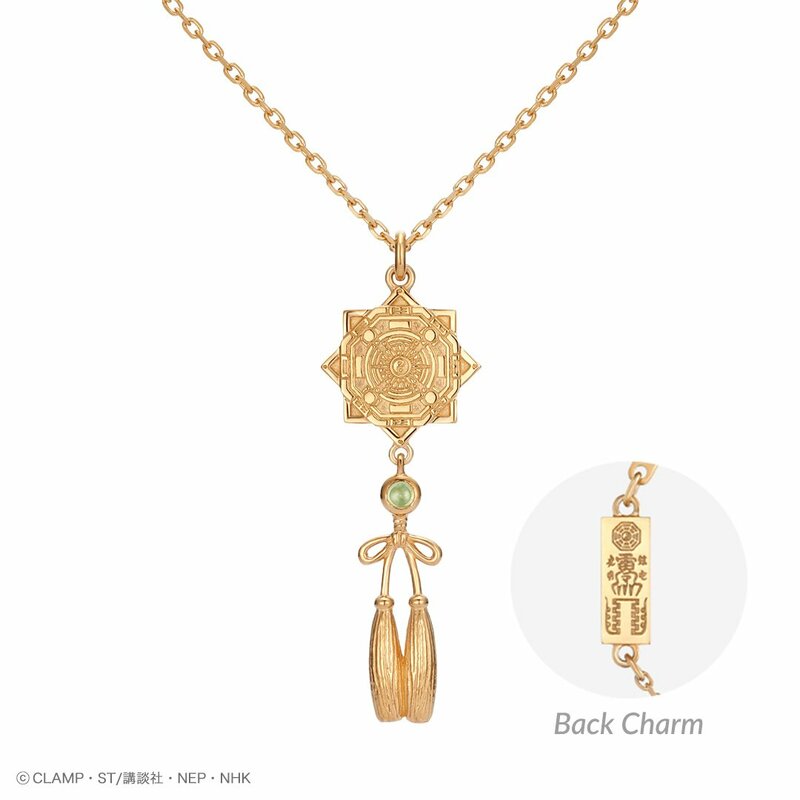 This piece has delicate details that stand out from all angles, such as the pattern on the Rashinban and the tassel that decorates Syaoran’s sword. This gorgeous necklace was made to avoid being thick or voluminous, so its long silhouette can be worn without trouble. A peridot in Syaoran’s image color, green, is embedded in the center. The charm on the back of the necklace is designed after the paper charm that he uses for his lightning spell, “Raitei Shourai.” This necklace will make you feel like Syaoran is always by your side. Yukito and Yue, two people who can never part. This necklace was made in the image of those two inseparable beings who share a body, accepting each other’s presence. Yukito’s design is of a crystallized snowflake. The detailed snowflake and crescent moon will give the wearer a calm and refined air. The amethyst used for their image color, purple, adds a mysterious atmosphere. 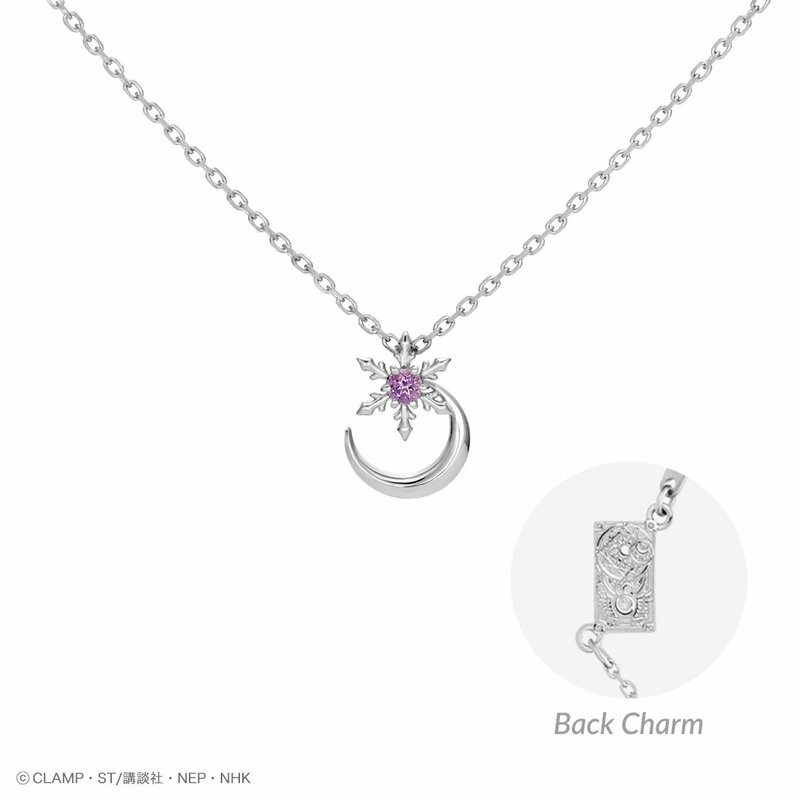 The charm on the back of the necklace is designed after the back cover of the Clow Book. 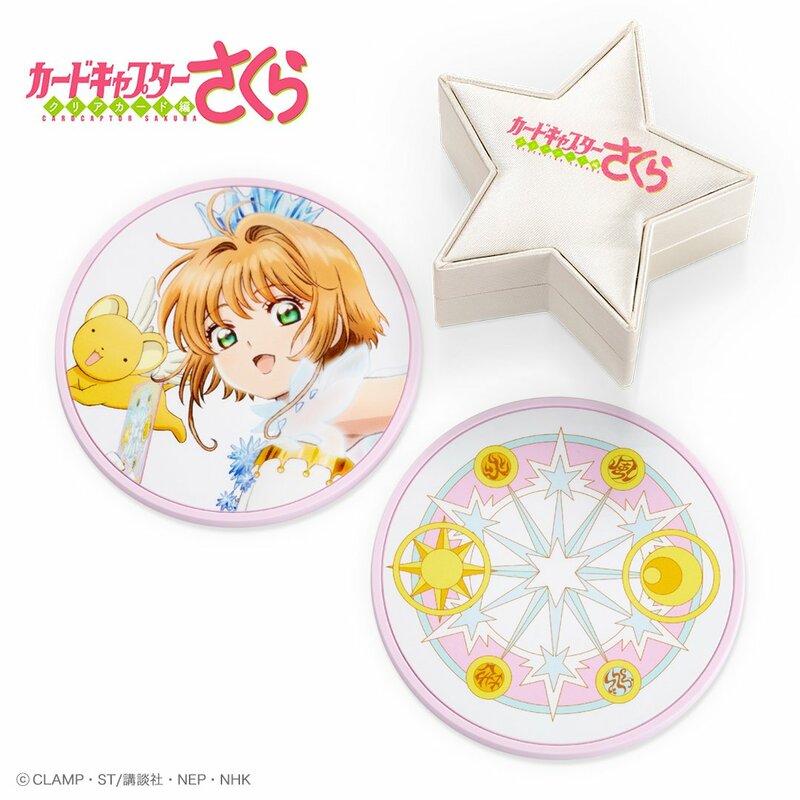 Those who purchase a necklace will receive one of two designs of an original Cardcaptor Sakura drink coaster. The coaster design cannot be chosen. Sakura, after gathering the Clow Cards and stopping them from bringing misfortune onto the world, changed them to her own cards using her own power. Now it’s April, with the cherry blossoms in full bloom, and she’s a first-year middle school student. There, she meets Syaoran again after his return from Hong Kong. Though they delight in being able to go to school together, Sakura discovers one night that the cards she gathered have changed...! Throughout the town of Tomoeda, mysterious things keep occurring. Led by the key that she obtained in a dream, Sakura once more begins to gather the cards. This brand was made to make those desires into reality. Even the smallest detail is made to perfection with the skills that only seasoned artisans hold. Please enjoy these authentic character jewelry, accessories, and merchandise made for adults. 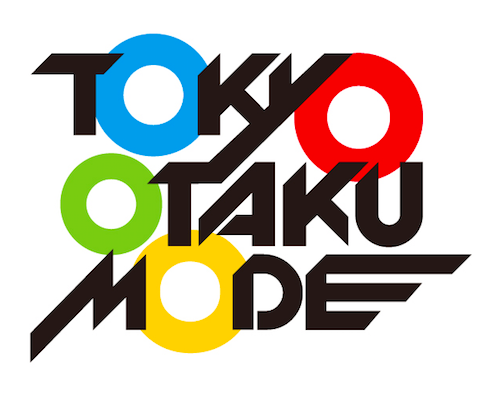 Tokyo Otaku Mode (TOM) shares with the world the latest Japanese pop culture news through its Facebook page, which has over 20 million likes, and sells products related to Japanese anime, manga, games, music, and fashion through its website, the Tokyo Otaku Mode Shop. A: They are scheduled to be shipped starting in late August 2018 after production is complete. Q: What payment methods are there? A: We accept credit/debit card and Paypal. Q: Why can’t I press the “Reserve” button? Q: How will you ship the rewards? A: Rewards will be shipped by EMS. A: Shipping address can be changed via your My Projects page. Please note that the shipping address is no longer changeable after we enter shipping preparations. The option will disappear once we enter shipping preparation. Q: Can I cancel any order? A: We do not accept cancellations.